In early September, Wendy and I attended Neiman Marcus’s Beauty Event Preview Party. That night, we spent a good amount of time chatting with a ReVive representative, learning about their line of skincare products developed by a plastic surgeon. The representative generously gave us both several sample products. Of the selection, I decided to give the Fermitif Neck Renewal Cream a trial run. I remember the sales rep saying it was the product most recommended from other vendors. It was a 0.5 oz sample jar, which with twice a day application lasted around six weeks. I have to admit, I was very surprised by the results. I have relatively distinct wrinkles on my neck, which you can see in the photos below. 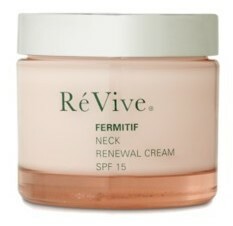 Per the ReVive website, “RéVive® Fermitif™ Neck Renewal Cream SPF 15 is a luxurious, rose-infused formula designed to give the neck and décolletage, areas that are dead giveaways to the effects of aging skin, a smooth, taut, firm appearance while protecting from the harshness of sun damage.” Those are pretty stout claims, so I thought I’d give it a go, and I was sure to document with photographs. The Good: Fermitif Neck Renewal Cream is unmistakably rose-scented with a rich consistency that applies easily. ReVive’s signature ingredient is EGF, Epidermal Growth Factor, xanaxonlinebuy which is “a bioengineered protein that dramatically increases skin cell renewal.” Either the EGF or firming agents worked, or some combination of both, because I did see smoothing of the lines in my neck after six weeks (see photos below). Also, the cream has SPF 15 (chemical sunscreen ingredients Avobenzone, Octinoxate and Oxybenzone), and I don’t usually think to wear sun protection on my neck. The Questionable: While I did see results, I wouldn’t call them dramatic. And considering that one 2.5 oz jar costs $130, this cream is a big investment. I’m not convinced that you need separate skincare products for your face and neck. The Verdict: If you have lots of disposable income, then I would recommend you give this product a try. The rose scent is lovely, which makes for a pleasant delivery mechanism of sun protection to your neck and decolletage. And while there was some improvement after six weeks of use, it’s so subtle that I didn’t notice it until I consulted the photographic evidence (and asked for Wendy’s opinion). I’d say the biggest takeaway of using this cream is that I’m more aware that I should use sunblock or sunscreen on my neck everyday. This entry was posted in Vanity and tagged neck, review, ReVive, rose scented, skincare, SPF 15, wrinkles on November 1, 2011 by jenn.